Everthing you need to know abou Solar Power for RV from RV solar battery charger, RV solar panel installation, RV solar systems, rv solar power kits, RV solar charger, RV solar panels, discover RV solar power now! Today's RV's have all the amenities of a traditional home. But full time RVing shouldn't limit you to just staying in RV parks to power all those luxuries appliances. You're a full timer so you can get off the beaten path and experience life out of the big city, on the back roads, on the beach, in National Parks, or even in the most remote locations. You still want to be able to use all of your appliances, charge your cell phones, and even power your laptop computers. If your batteries are not recharged they will definitely not last as long, but you can recharge them using RV solar electric. These solar panels will produce electric as the sun shines on them and will keep from destroying your batteries life. One of the best things about solar power is how clean and quiet it is. We used a traditional gas generator in our motor home when boon docking. It was mounted just inside the basement by the driver's side. The fumes from that gas generator came in the window and could have killed us! It stunk really badly and we had to close all the windows just to use it. That was terrible since we were trying to enjoy the great outdoors and the lovely breezes. If we had been using RV solar electric, we wouldn't have had any of those problems. 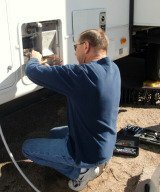 We needed a power source that was clean, quiet and didn't fill our RV with chemical exhaust fumes. If you have a traditional gas generator that's fine for times when it's cloudy, or as a back up just in case, but use solar power for RV will be a better option for most of the time. These lightweight panels are easy to store and travel with, or mount them to your RV for easy setup. 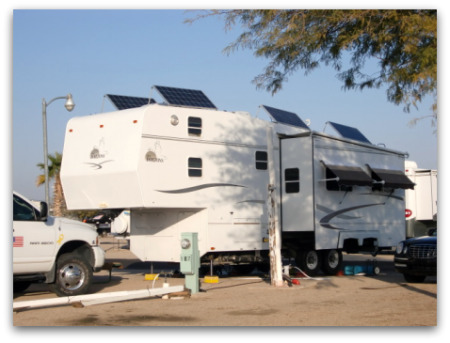 Since they don't have any moving parts these RV solar systems have almost no maintenance or upkeep, and you don't have to fill them with fuel or deal with stinky exhaust fumes.